The show aired December 3, 1968, but I’ll be honest. I don’t recall seeing it at that time. I don’t know if my parents just didn’t allow us to watch it, or didn’t think about it (I was seven years old). My first memory of seeing the special was the following year in August, 1969 when my family traveled from Oklahoma to California, making stops in various states, including to visit my half-brother in Colorado. (They piled 5 kids in a station wagon Mom earned from selling Tupperware, and we embarked on the well over a thousand miles journey…what were they thinking???) I’m guessing the special was re-broadcast, or my memory is totally skewed, but I have this recollection of being at my half-brother’s house, and the 68 Special playing on his television. I was enthralled, captivated, couldn’t take my eyes off the screen. 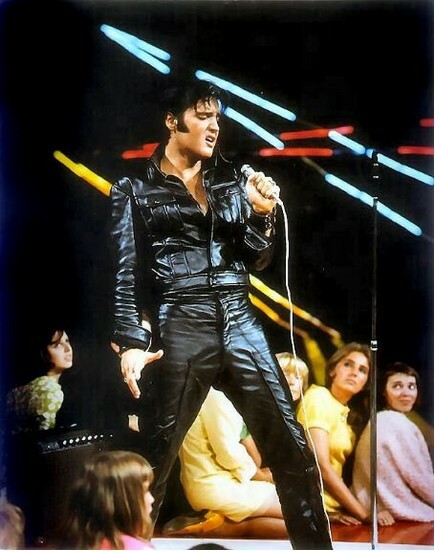 I’d already loved Elvis for as long as I could remember (and at 8 years old, that wasn’t all that long :)), but it was my first time to actually see him perform, other than in his movies, to see his amazing stage presence and the way he interacted with an audience and held them under his spell. Fortunately for all of us lucky enough to have seen Elvis in concert (for me, 3 times), this was the beginning of Elvis’ return to live performances. The 68 Special was a smashing success. It was viewed by 42% of the audience and was the number one show that year, receiving critical acclaim and rave reviews. Elvis was indeed back. What about you? Have you seen the special? What did you think? My husband and I saw his final concert at Market Square Arena in Indianapolis. Somewhere I have pictures from it. If I ever find d them I’ll try to download them. Oh wow, Debbie. That’s awesome. I would love to see the pics. The final time I saw him was March of 1977, and I also have pics, but we were so far away, he just looks like a little dot. 🙂 But still, I know what they are! As your #1 Elvis buddy & sister….I have to tell you I still learn stuff about Elvis on your blog’s. I think it is super cool for you to have this blog! I know SOME of what you mention in your posts but always learn something new! I remember the ’68 special at Eddie’s house! We were way too googly-eyed to be 5 & 8 years old! Remember he took us 4 girls to the drive-in to see “Elvis On Tour”?? What was HE thinking?? HA! I too feel extremely blessed to have gone to 3 Elvis concerts (’75 ’76 ’77). But most of all….I feel blessed to have not only enjoyed them , but lots of other Elvis memories with the best sister & friend a girl could ask for…as well as the BEST ELVIS buddy…EVER!!!!!! Right, they never kept us from Elvis or thought he was bad to watch, but I’m wondering if we were being punished for something or maybe weren’t home, or…you know, something. Yes, Momma loved him too and they let us watch all the movies and even go to the Chieftain to see him and put posters all over our walls. 🙂 Haha, I do remember Eddie taking us. I believe he regretted it almost immediately. Whew, so it wasn’t just me, we really did watch it at Eddie’s! I love you very much, and I’m so happy we have all those Elvis memories to share too! I’m glad you enjoy the posts because I love writing them. You’re the best Elvis buddy a girl could have too!!! That was one of my favorite specials, and especially the “in the round” segment. Great stuff.